Mendelssohn’s Three Motets, op. 69, and Three Psalm Settings, op. 78, belong to the standard repertoire of many choruses and vocal ensembles. Our editions, the work of two leading Mendelssohn specialists, Hiromi Hoshino and Michael Cooper, present these pieces in separate volumes reflecting the latest state of scholarly research. We also offer a separate edition of Psalm 91, “For He shall give His angels charge”, in its original setting for eight-part a cappella chorus. (Mendelssohn later incorporated it into “Elijah” with an orchestral accompaniment). 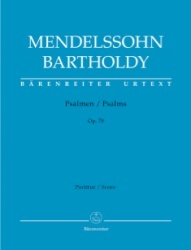 Each edition contains the original German text and the English translation authorized by the composer himself. A two-stave reduction of the vocal parts has been added as an aid in rehearsal. Complete editions are available with critical reports and introductions in German and English.